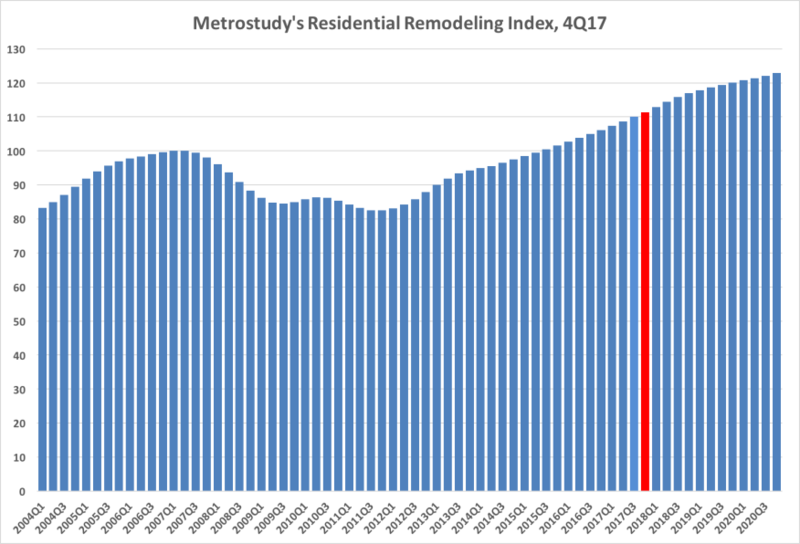 Big-ticket residential remodeling activity nationwide will rise faster than previously expected, increasing 5.2%, and then continuing to go up through 2020, Metrostudy announced today in conjunction with the release of its latest Residential Remodeling Index (RRI). The strong economy and increased demand because of 2017’s natural disasters led Metrostudy, a sister company to REMODELING, to boost its 2018 prediction from the 4.7% rise in activity it forecast three months ago. Metrostudy now predicts there will be 12.57 million projects launched in 2018 that are worth at least $1,000. That’s up from 11.96 million last year. And, partly because of inflation, the total amount of money spent on those projects will climb 6.8% to $171.1 billion, Metrostudy predicts. The RRI as of the fourth quarter of 2017 stood as 111.3, its highest reading ever. That number means the economic conditions known to influence remodeling activity are 11.3% better than the old peak in early 2007, just before the Great Recession. The RRI has shown year-over-year gains for 23 consecutive quarters. “Remodeling activity is robust, reflecting a U.S. economy with strong underlying growth. The most elusive indicator through the nine-year recovery has been wage growth, which finally made a strong showing during this past quarter,” said Mark Boud, chief economist at Metrostudy. “Several times in the past few years, wage growth appeared to be picking up, only to be downwardly revised in subsequent reports. However, there is greater optimism that 2018 pay gains will be more durable. Metrostudy also noted that all 381 metropolitan statistical areas for which it does local RRIs will see growth this year. The average increase will be 4.6%. The index is based on a statistical model that takes into account such data as household level remodeling permits, employment statistics, and a market’s economic health. It then uses that model to predict the number and dollar volume of home improvement and replacement projects worth at least $1,000.